From the original clone-tastic One For All to the sand-strewn battlefield of Ascension, rotating game modes provide unique spins on the classic League formula. It’s time to kick things off with the next game mode in the rotation: Hexakill: Twisted Treeline is now live! It’s Twisted Treeline, so there are altars to capture and a nexus to explodify. It’s Hexakill. So there are six champs on your team instead of three. Hexakill: Twisted Treeline is now available and lasts through the evening on Monday (we’ll shut it down very early Tuesday morning--usually between 1:00 AM and 3:00 AM). We’re looking for your feedback as we go, so let us know. 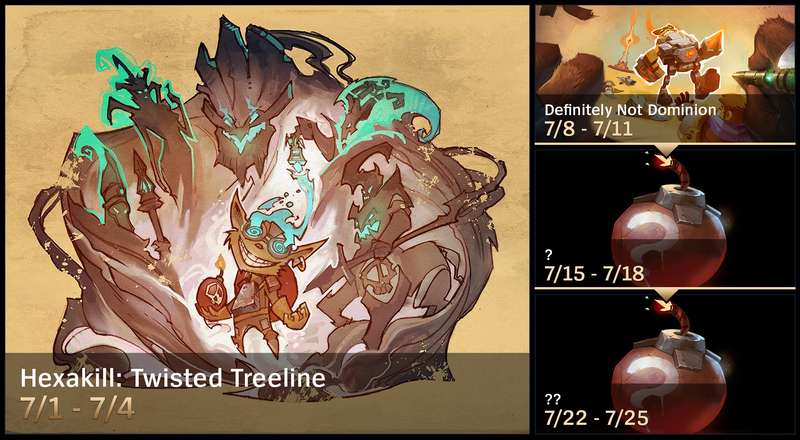 GLHF, and we’ll bring a sixth man alongside you in the Twisted Treeline this weekend.